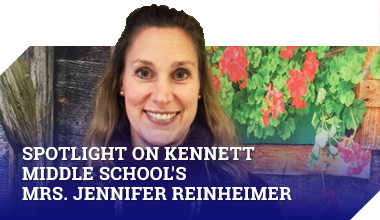 Hey Kennett Middle School – Check this out this fun fact – In gym class, many students jog warm up laps around the basketball court. If you ran 524 laps around the basketball court, that would be 26.2 miles….or more commonly known as a Marathon! Did you know one of your KMS teachers is running the Chicago marathon this weekend? Today, please be sure to wish Mr. Reggio good luck on his 524 lap race in Chicago! Attention 8th graders: Over the last two years we’ve assembled a team of 8th graders and competed in the annual “What’s So Cool About Manufacturing” documentary contest. Each year, we’ve brought home some hardware. Two years ago we won the “Viewers choice” and last year we brought home the award for “Best Manufacturing Message”. Let’s do it again! If you’re interested, please meet in Mr. Malkasian’s room (F111) this Friday at lunch to discuss and assembly our team. Albert Einstein once said, “Only a life lived for others is a life worthwhile”. Would you like to have the opportunity to give back to your school and local community while working on leadership skills? If so, we have a service learning opportunity for you! If this sounds like something you would be interested in, come to the counseling office to see Mrs. Stoudemire or Ms. Gregory for more information. Congratulations to the KMS XC team for their strong running performance at yesterday’s home meet! They had a lot to contend with as the first runner crossed the 2.1 mile finish line in 11 minutes and 50 seconds. Sneakers off to our top performers in yesterday’s event, Jack Igo, Grayson Zubrod, Gage McKenna, Matt Wilson, and Sam Kjelstrom, along with Sadie Maxwell, Lexi Hoyle, Anna Jiang, Catherine Caldwell, and Sharon Maxwell. Wish our whole team of 39 runners speedy feet as they get ready to race again next week. For those participating in Running club, we encourage you all to come out and join us next year!! Wednesday afternoon, the 8th grade field hockey team defeated Penns Grove by a score of 5-0. With the aid of stellar defense by Kaitlyn Stolp, Elizabeth Calhoun, Molly Kaplan, Isabelle Scopio, and Hayley Holder, Georgia Fay and Maddi Sears kept Penns Grove off the scoreboard. Megan Ward scored two goals. Lucy Myers, Raina Bickel, and Jordyn MacMillan each added one goal. Way to go Kennett. Please stay tuned for a special from Student Council.